Some kinds of rodents have become cosmopolitan and are sometimes responsible for transmitting diseases. It is important to stop the Rat disaster from beginning. Adzpow can handle it from the source. So far, Adzpow Rodent Catcher is the most effective and efficient mouse trap which is safe and hygienic, It is able to hold the rat tight with 50% more force than other traps, making it faster and 100% kill the rat. 4. It is advisable to use a stick or other tools if you want to release the trap for safety purposes. Put the mouse trap to places where mice usually go through.Heading to the Wall Side. If you have any question, please feel free to contact us!!! 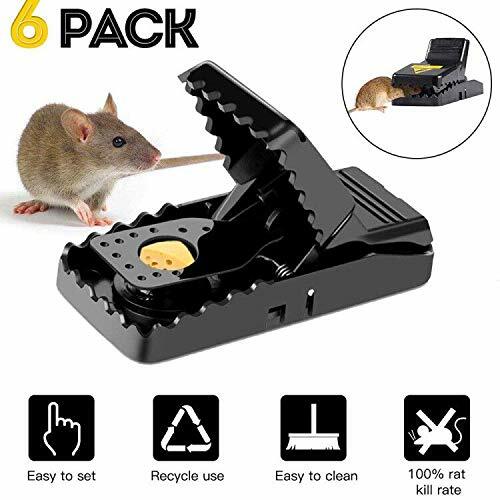 Upgrated Adzpow Mouse Trap -- Extremely Sensitive and Effective 6 pack mice trap, Environmentally friendly methods for eliminate mouse, Better than Glue & Poison. 100% Rodent Killers -- Completely Eliminate Rats, suitable to quick kill mice, mouse, rat, chipmunk, squirrels, voles and similar-size nuisance animals. Compatible -- Be Used indoors or outdoors, Kitchen, Garden, Garage, Warehouse, Bathroom , Living Room, Basement etc, keep your food, family and house away from Mice Trouble. Warrenty -- Quick respond for any issue, Service always online for your use. If you have any questions about this product by Adzpow, contact us by completing and submitting the form below. If you are looking for a specif part number, please include it with your message.